The Pioneer Generation package – which will see pioneers receive their first round of benefits in the form of Medisave top-ups from July – was introduced for those who were born before 1950 and who became citizens before 1987. About 450,000 seniors can expect to receive their Pioneer Generation Package welcome pack in August this year. The welcome pack contains the Pioneer Generation Card, which entitles seniors to receive special subsidies at general practitioner (GP) and dental clinics under the Community Health Assist Scheme (CHAS), polyclinics, and Specialist Outpatient Clinics. Eligible seniors will be able to use the Pioneer Generation card from September. Above is an ex classmate of mine who is thrilled to have received his PGP last week. 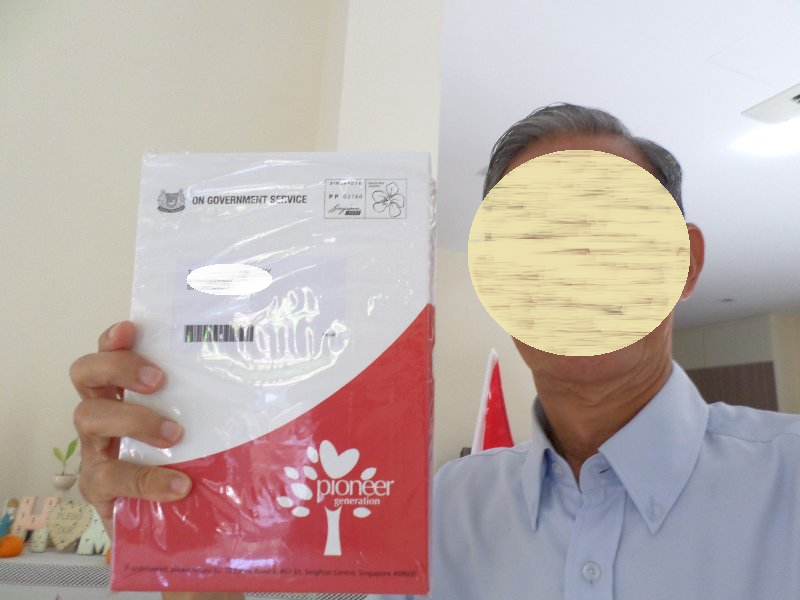 He was so happy that he bought a S'pore flag and displayed it at his place. As for myself, I've not received the package but the $500 was banked into my account a few days ago. Strangely my classmate was only given $250. Aiya maybe bcos he lives in landed property, thats why he receive lesser. I think u r rite Jacky cos he is quite rich too.